A poignant scene at Los Angeles International Airport over the weekend. 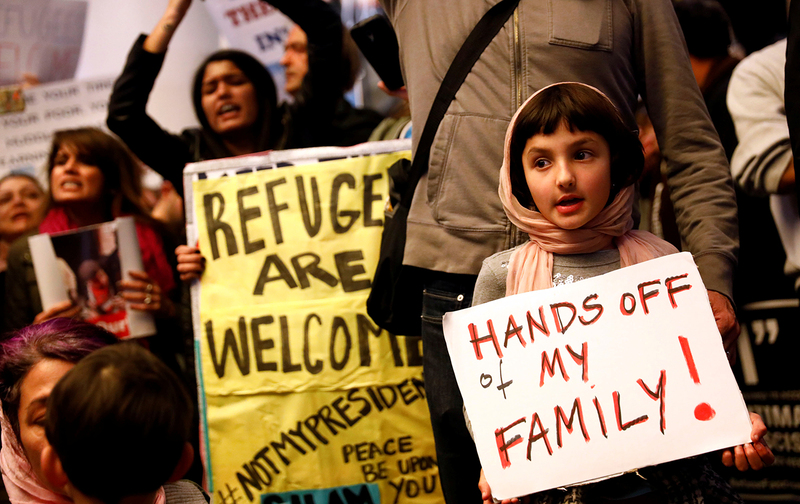 Los Angeles—The early hours of resistance to Donald Trump’s executive order restricting travel for refugees and nationals of seven majority-Muslim countries had an improvisational feel. Initially on Saturday evening, police, some carrying riot gear, outnumbered the protesters at Los Angeles International Airport. The ball of outrage the apparent targeting of Muslims by the Trump administration had yet to begin accelerating downhill. I had flown into LAX an hour earlier, and I got an alert about the local SEIU chapter staging a protest at the international terminal. My wife and I walked across two terminals with our luggage and waited for others to arrive. Eventually they did, in waves, doubling and tripling in size in a matter of minutes, running toward the terminal entrance with T-shirts and pink hats and signs recycled from the previous week’s Women’s March (one sign-bearer helpfully stuck the disclaimer “last week’s protest” onto the front). At least 1,000 people arrived within the hour. By this time, news of the federal judicial ruling in New York hit people’s phones, and murmurs grew about a stay of the executive order for those in transit when it was signed. That news reached the megaphone, and the crowd let out a shout of triumph. But it was only a temporary battle in what will become a war in the courts to fight the travel ban. Among the protesters was Mohammed Al Rawi of Long Beach, an Iraqi who worked with the Los Angeles Times in Baghdad as an IT manager and translator. His father, Qassim, was scheduled to arrive in Los Angeles from Baghdad this weekend, but while connecting through Qatar, he was stopped and told by a representative from the US Embassy that his visa had been invalidated. After 10 hours in a holding area, Qassim was sent back to Baghdad, deported without ever reaching American soil, extending the two years since he has seen his grandchildren. Mohammed’s own story is harrowing. When he started working for the American press in Iraq in 2003, local Al Qaeda groups marked him as a spy. “They put a price on my head, they broke into my house multiple times, they looted everything from my house, they set my belongings on fire.” Mohammed said. “They told all my neighbors they would be looking for me, so I couldn’t come back to my house.” Mohammed lived in the LA Times office for three years. Asked if he had any statement for Trump, Mohammed replied, “The one thing I want to tell him is I myself am a victim of terrorism. And I would support any action to prevent terrorist attacks anywhere in the world.” But he questioned whether this order, which targeted countries that have not been the sources of any terrorist attacks on US soil, would achieve that purported goal. Nor would arbitrarily keeping apart families that have already been haunted by terror make anyone safer. Protests at LAX and other airports, city-hall steps, and Trump hotels nationwide have exploded since those first hectic hours. Indeed, on Sunday, a much larger horde of demonstrators at LAX sat down inside the international terminal in front of the closed doors of the Customs and Border Protection office. But the power of outrage, which has already claimed a small victory in permitting travel for lawful permanent residents, was present from the start.